Asset Sale Vs Share Sale: Does Selling Assets Get A Better Price Than Selling Shares? While a share sale vs an asset sale might appear like accounting mumbo-jumbo - a sale's a sale, right? - it's worth recognising the difference and the pros and cons of each option. Business disposal of limited liability (Ltd) companies can be done in two ways. 1. The Share Sale: You can sell the whole legal entity that is your business - the complete package of assets and liabilities. The new owner will effectively step into your shoes. This is known as a share sale. It is done by you transferring all your shares in the business over to the buyer. The transaction is between the buyer and you (not your company). The buyer makes payment to your personal account (not to the company bank account). Once you've sold the shares you'll no longer have any ownership of any part of the business ... though it is sometimes agreed by both buyer and seller for the seller to continue as a director for a while. 2. 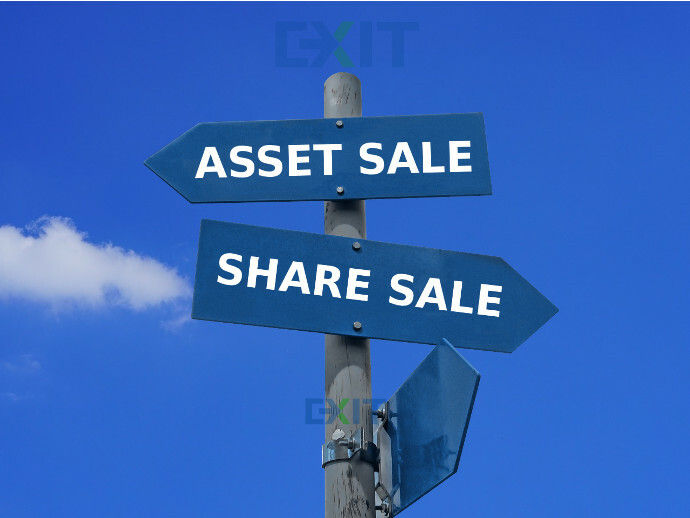 The Asset Sale: In this scenario, the assets of the company transfer to the new owner, just the assets. All the liabilities of the business are retained in the business. The deal is between the buyer and your company (not you) as the buyer is buying assets from the company. The money will be paid into the company's bank account (not yours). After the sale you'll still be the owner of the business but it will be of a business that has little to no assets. The business will still have liabilities though! You can use the money in the company bank account to clear the liabilities - pay them off - and apply to Companies House for a striking off (a closure of the company). Business buyers generally prefer to purchase assets rather than shares. Sellers prefer to sell shares as that is cleaner for them and more tax efficient. But the choice is a little more nuanced as we'll discuss below, and the price is significantly influenced by the decision. It's common knowledge that the end of year balance sheet for a typical limited company has some assets and some liabilities. Common assets are stock, vehicles, machinery and tools, IT equipment etc. These are "physical" assets. There are other assets in the balance sheet which are "intangible" such as accounts receivable (people who owe the business money) and cash in the bank. What many small business owners forget is that the business also owns assets which don't appear on the balance sheet - trademarks, reputation, licences, copyright and patents etc., are common examples. *The buyer is acquiring the stock, furniture & fittings and debtors for a total of £10K + £2K + £5K ie. £17,000. The £383,000 balancing figure is effectively what the buyer is paying for goodwill, trademarks, patents, the customer database, custom software that may have been created, copyright in designs / content / images / video, the business website and all the other intangible assets (the actual intangible assets vary from business to business). The buyer pays his £400,000 into the business account. After he's made payment, the balance sheet looks different, see below. All the assets have gone and the bank balance has increased from £3,000 to £403,000. And the company still has creditors of £6,000 (who will need to be paid out of that £403,000). But here's the snag. As far as HMRC is concerned the business has sold £17,000 worth of assets for £400,000 and has made a "profit" of £383,000. They now expect tax to be paid on that profit. Not fair, I know. But I don't make the rules. You'll notice that it's exactly the same as it was originally! That's because there has been no transaction between the buyer and the company. The deal was between the buyer and the owners of Acme Ltd. The buyer bought £2 worth of shares for £400,000 and paid the £400K to the owners' personal bank account. The company accounts remain unchanged. The only thing that changes in the company records is the name of the owner of the share/s. As far as HMRC is concerned the owners have sold £2 worth of shares for £400,000 and made a profit of £399,998! But here's the good news: There are various tax reliefs to reduce or completely eliminate the profit made from selling these shares, tax reliefs that only apply when selling shares and do not apply when selling assets. Better negotiating power: As buyers prefer to buy assets, the seller can often negotiate to get a higher net benefit for himself under an asset sale than a share sale. The seller is taking on the responsibility (and cost) of clearing the liabilities and doing other tidying up post-sale. He therefore deserves a higher reward. Quicker sale: As there is less due diligence for the buyer to perform in an asset sale, the transaction can often be completed more quickly. Further, an asset sale has less chance of falling through as a result of an unexpected glitch during due diligence (and such "glitches" are not uncommon in share sales!). Further, the seller may be forced to retain assets such as social media accounts (as social media companies often do not allow the transfer of accounts). Such retention is possible under an asset sale but not under a share sale. Where the seller sells assets at a loss he can (generally) use those losses against gains made elsewhere in his business. It is sometimes the case that not all owners of the company are agreed on the sale of the company. The Articles of Association and/or the Shareholder Agreement may restrict the sale of shares. In these situations a sale of the company's assets is sometimes used as a way around the restrictions. As with everything else on this page, legal advice should be sought before taking any action. Third party approval of the transaction is sometimes required and this can often prove problematic and delay or even completely destroy the deal. A good example is the lease. Landlords often prove difficult when it comes to transferring the lease to a new owner. Their lawyers may require the buyer to come up with large deposits, provide personal guarantees, even agree to a higher rent. And these lawyers can often be slow and non-responsive. It's not unusual that the seller loses a good buyer because he cannot get a third party to co-operate. There are also difficulties with transferring customers to a new owner. It's not unusual to lose customers at this point. The tax calculation can be quite complex as different categories of assets may have to be treated differently for tax purposes. If on a capital asset the seller has claimed capital allowances, and then sold the asset for more than the book value, he may be liable to a "balancing" charge. The value in some assets may be lost altogether. Assets like permits and licences often cannot be transferred to the buyer and any investment made in developing those assets will be lost. Another issue is personal data. ​Your customer list - and all the information you have about customers, from address o their history of orders ​- is owned by the company and the company can't sell that data to a buyer. That data resides with the company and transfers to a buyer only if the buyer is taking over the whole company (ie. the shares). This applied even before GDPR. There is a potential for the seller to be taxed twice. If the business sells assets at a gain it will have to pay tax on those profits made. But when those profits are distributed to the shareholder/s (usually via dividends), it is taxed again! Easier due diligence; As the buyer is taking on just the assets, there's less due diligence to be done. Yes, the assets need to be thoroughly checked and the true value of the assets needs to be determined, but the buyer doesn't need to worry about some nasty future liabilities arising as a result of how the business was run prior to his taking over. He doesn't need to worry about a past customer suing the business or an ex-employee claiming unfair dismissal. The buyer is responsible for only those contingencies that arise subsequent to the sale. Tax advantages: When the buyer takes on a set of assets from the seller's company, he may agree one figure for the whole set of assets, but when he's putting the assets on to his own books he might allocate a higher value to those assets like stock and IT equipment on which he can claim depreciation and a lower value to assets like goodwill on which he can't claim depreciation. This can have significant tax advantages. "Extracting" other losses: When a buyer acquires assets such as stock and sells them for a price lower than what he paid, he incurs a trading loss that can (generally) be set against his other profits to reduce tax liability. Similarly with losses on capital assets (if capital allowances haven't already been claimed on them). Loss of customers: Customers who are signed up to automated payments, online payments or recurring payments will need to make changes to their payment details for their payments to the buyer's company. Not all will comply and some may choose to take their custom elsewhere. After all, they don't know this new owner and have never dealt with him before. Loss of suppliers and other relationships: Existing deals and arrangements with suppliers, the bank etc., will not transfer over with the assets, they will remain with the old company. If the buyer needs these relationships he'll have to negotiate them afresh. Buying the assets of a business often triggers TUPE [Transfer of Undertakings (Protection of Employment) Regulations 2006]. The buyer may be responsible for taking on all the employees of the business on the same terms they enjoyed before. Whether or not TUPE applies in any individual case is a matter for the buyer's legal advisers. But if TUPE does apply that can be a considerable liability for the buyer to take on. There may be VAT to be paid on the purchase (unless the transaction qualifies as a "transfer of a business as a going concern"). Transferring numerous assets individually - where there are different routes to securing title - is time consuming and awkward. For example, the transfer of a licence works differently to the transfer of a lease which works differently to the transfer of patents. Tax advantages: When selling shares the seller is usually able to take advantage of Entrepreneurs' Relief (and CGT allowance and other tax breaks) to remove part or all of the tax liability he would otherwise have. Peace of mind: A share sale is the simplest and cleanest sale from the seller's point of view. Subject to any deal he's done with the buyer to provide some limited period or support / handover, the seller is free. He's completely out of the business ... and it's someone else's baby (or headache) now. Rollover: Where the seller takes part of his price in shares of the acquiring company he can "rollover" or defer some of the tax he's otherwise liable to pay on the gains he has made. However attractive the seller may feel his business is ... it is unlikely buyers will rush into the purchase. They'd want to examine everything very, very carefully and this can add months to the length of the transaction. Share sales typically take a lot longer to complete than asset sales. Further, the buyer's advisers will insist on various protections for their client and will want the seller to provide warranties, guarantees and indemnities to limit their client's risk. The negotiating of these terms can also drag out the transaction. The longer a transaction drags, the greater the chance of it collapsing altogether. Under a share sale arrangement it's not easy or cheap to remove assets from the company prior to the sale of the company. And removal of some assets makes them worthless! Take eBay and Amazon accounts, for example. The seller can't remove the eBay account from the company to their personal name as that involves a transfer of the account - something that eBay / Amazon generally don't allow. Personal guarantees: Over the years the seller may have extended personal guarantees (PGs) to various parties. Banks take PGs when agreeing an overdraft, for example. Hire purchase companies often require the business owner to sign a personal guarantee. When selling a business these parties won't generally waive the PGs or transfer them to the new owner. These loans / liabilities will generally have to be cleared by the seller if he wants to be relieved of his responsibilities under the PGs. If the seller doesn't extricate himself from the PGs he puts himself in a dangerous position as he has no control of the business - he has sold it - but he's on the hook for the overdraft or other liabilities. Share sales are more expensive when it comes to professional fees (how much do brokers / business transfer agents charge?) as there's usually a lot more work involved. The buyer's due diligence may raise questions that the seller can't answer himself and which require professional advice. Employee contracts are often one such area and the seller may need to get a written opinion from a lawyer in order to reassure the buyer that the employee contracts are within the law. There could be other areas in which the buyer needs written legal assurances to confirm the business is operating within the law. Further, when it comes to the drawing up a final contract for the transaction the legal fees are higher because of the warranties, guarantees, indemnities and covenants that need to be inserted in the contract to protect the buyer's interests and provide him some reassurance. The negotiation of these terms and reaching final agreement on the wording of the resultant contract takes a lot more of the lawyer's time and legal fees can soon escalate. While some lawyers offer a fixed fee arrangement, many realise that it's not easy to estimate how long these matters will take and so they charge by the hour. Big Company Ltd bought the shares of Acme Ltd for £400,000. Acme's account show an accummulated loss from previous years of £120,000. Big Company Ltd, in their first year of operating Acme Ltd, make a profit of £150,000. They can subtract the previous losses and pay corporation tax on only £30,000 (£150,000 - £120,000). At a 20% rate of corporation tax Big Company Ltd pay £6,000 in tax rather than the £30,000 they would have paid otherwise (20% of £150K). Customers transfer over seamlessly. Relationships with suppliers, bank etc., also transfer over smoothly and don't need to be renegotiated. There is no break to the business, it continues without interruption. Title in everything rests with the company, not the owners, and by acquiring shares the buyer gets (clean) title to everything that's in the company name. There is​ some scope to change employees' terms of contract or dismiss employees as TUPE generally does not apply. TUPE = Transfer of Undertakings (Protection of Employment) Regulations 2006. Buying shares is a lot riskier for the buyer as he's taking on all the business liabilities, and the true nature / cost of some of the liabilities may not be fully apparent till a year or two down the road. There could also be liabilities that the buyer hadn't spotted. For example, if on the day after the business changes hands a customer makes a personal injury claim on the business for a faulty product bought some days ago ... that is a liability that falls on the new owners, not the prior owners. Staff could also use the opportunity of new owners to make backdated claims against the business. Claims that would not have been made on the previous owners may suddenly emerge out of the woodwork. And the new owners would find themselves having to foot the bill of going to an industrial tribunal ... or simply paying off the compensation claim. Share sales are more expensive when it comes to professional fees. They are more expensive for the seller for the reasons described above, but they are more expensive for the buyer as well as there's a lot more work for his advisers to do. Stamp duty is payable by the buyer when purchasing shares. It was 0.5% at the time of writing this article. While TUPE (Transfer of Undertakings, Protection of Employees Act) doesn't apply to share sales, the buyer is effectively taking on all the employees and is responsible for honouring the contracts under which they were employed. And that includes taking on existing disputes, tribunal cases etc. 1. In an asset sale the seller typically sets the price to be beyond the total value of assets that appear on the balance sheet. That's because not all assets appear on the balance sheet. "Intangible assets" such as goodwill, trademarks, patents, website, customer database and all the other assets that are intangible and can't be touched or felt aren't included in the B/S and the value of these assets, too, needs to be included in the price. The price the seller gets - if the seller has built value in the business and made it an attractive target for buyers - will be large enough to pay off all the liabilities and leave a surplus. That surplus - what will be left after paying off all the liabilities - is what should be important to the seller in any negotiations with buyers. 2. Caution with asset sales: Don't assume all assets are transferable. Assets like social media accounts, Amazon / eBay seller accounts etc., are usually not transferable. In an asset sale the buyer may consider these assets worthless as they won't transfer to him ... and that will affect the price he is willing to pay. 4. Whether to go for a sale of shares or a sale of assets is not a choice that necessarily lies with the buyer or the seller - it's a matter for negotiation between the parties. A buyer who prefers an asset sale may be persuaded to accept a share sale instead if the seller is willing to make a large concession on price. Similarly, a seller who's insisting on a share sale may be willing to accept an asset sale if the buyer significantly increases his offer price. 5. Sometimes circumstances determine the choice. If the most valuable assets in the business can't be transferred to a new owner, as discussed in an example below, then the buyer may need to purchase the shares to get his hands on those assets. On the other hand, if the seller is finding no takers for his offer of shares, he may need to re-evaulate his plans and reconcile himself to selling the assets instead. 6. In many distressed companies the only way to extract value from the business is to sell the assets (how to sell a loss making company?). Outside of distressed firms, there are other circumstances in which sellers find that buyers are only interested in the assets and not the shares of their business. Conclusion: There is no one right or wrong way to sell a business. Once there's a buyer and seller in place, all the terms of the deal are subject to negotiation. The price is going to be influenced quite substantially by whether the sale involves a sale of shares (also referred to as stocks when talking about the shares of large companies that are traded publicly) ... or a sale of assets. Except in small deals it is best to get professional advice and guidance with negotiating these transactions. Have a question? Need assistance with the sale of your business? Get in touch​ ​for a free initial consultation.